“Mommy, can you help me to tie pleats?” Dot asked. “Why do you want to tie pleats?” I asked. “I want to look pretty.” Dot replied. Dot is getting more conscious of how she looks and she wants to dress up pretty. She likes dresses that she can twirl around, like the red and purple dresses we bought from Pumpkin Patch. Photos were taken at Marina Bay Sands. Pumpkin Patch is now having 30% to 50% off retail price for all goods storewide; valid till 31 December 2013. The jeans we bought from Pumpkin Patch is very comfortable to wear. It’s good for outdoor activities like nature walk, hiking, trekking or even normal day casual wear. Photo was taken at Cameron Highlands. Looking pretty is easy with Pumpkin Patch! The children’s summer wear will be out in the second week of January 2014. This is part 4 of the 5 series of posts on “Children’s Fashion“. 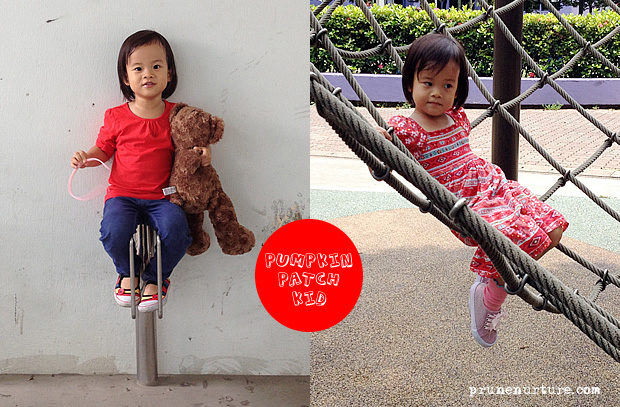 Dot’s outfits are sponsored by Pumpkin Patch Singapore.